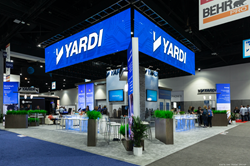 Yardi wins Best of Show with their 50'x50' exhibit, designed and manufactured by The Trade Group, at the NAA "Apartmentalize" 2018 show in San Diego. They also received an Honorable Mention for their Yardi Breeze 20'x20' booth. Brigitta Eggleston, National Marketing Manager for Yardi...explains, “The Trade Group is amazing to work with, and they have such creative ideas. They really know who we are and understand our needs. The Trade Group is also very attentive and meticulous in making our vision come to life." When Yardi needed an updated trade show exhibit for the 2018 NAA (National Apartment Association) Apartmentalize trade show, they reached out to The Trade Group for help. Yardi, the leading provider of high-performance software solutions for the real estate industry, and The Trade Group have collaborated on exhibit design for nearly a decade. This year, that collaboration really paid off when Yardi earned the Best Island Exhibit award at NAA Apartmentalize 2018. With the 50’x50’ island exhibit, Yardi was looking for a design with a clean, welcoming, modern feel that would allow them to meet with customers in a variety of settings – private, semi-private and open. The design featured wood, metal and brick accents, as well as a conference room enclosed in frosted glass. A large center tower with storage closet anchored the space. Lighting was also thoughtfully planned throughout the exhibit. The 30’x30’ LED hanging sign was a real showstopper. However, it was critical that the monitors and lights on the counters and elsewhere didn’t compete with the sign. Along with the sign, Yardi believes great video presentation, the inviting open concept design, backlit real life graphics, clear and concise messaging and branding of multiple products made an impression on the judges. As for next year’s NAA Apartmentalize show, plans are already in the works. “We’re going to step it up again for 2019. When you win an award like this, you’re faced with the challenge of how to meet or beat it next time, so we’ve got a couple of ideas up our sleeves. We are excited to work with our own Yardi design team and the team at The Trade Group, so we can knock it out of the park again next year,” Eggleston says. To learn more about The Trade Group’s trade show exhibit design capabilities and related services, call 800-343-2005 or visit http://www.tradegroup.com. The Trade Group is an award winning, full-service event marketing and creative design firm, specializing in trade shows, esports events and activations, corporate events, brand activations, retail merchandising, commercial graphics and experiential solutions. Since 1986, their team of live event, design and engineering experts has helped thousands of clients amplify their brands and successfully navigate a wide range of events and experiences. Clients rely on The Trade Group for: event ideation, creation and production; esports expertise; exhibit design and fabrication; graphic design and production; strategic marketing solutions; technology integration and more.